Fake News 2: Did the Horatii kill the Curiatii? Jacques-Louis David (1748–1825), The Oath of the Horatii (1784-85), oil on canvas, 329.8 × 424.8 cm, Musée du Louvre, Paris. Wikimedia Commons. Publius Horatius Cocles, the lone defender of the bridge, came from one of the great families that made up the original Romans: the Horatiuses, or in Latin Horatii. By far the most famous of the Horatii, in both Roman history and in art, are the triplets who are claimed to have saved Rome in another battle, this time fought between just six men. In legend, Rome was founded by Romulus, but had a long history before that, going right back to Aeneas and the other survivors of Troy who escaped with him. At the end of Virgil’s Aeneid – the epic story of their wanderings around the Mediterranean – Aeneas is in Italy in the vicinity of what became Rome, destined to bring about the founding of a great city. This is often interpreted as the founding by his son, Ascanius, of Alba Longa, rather than Rome itself, the later Romulus and Remus being descendants of Aeneas. Later, in the early history of Rome, its (also legendary) king Tullus Hostilius fought a war with Alba Longa, eventually resulting in the latter’s destruction. The battle of the Horatii is a legend within that legendary war. Rather than set their armies against one another and lose many valuable citizens, Tullus and the king of Alba Longa made a gentlemen’s agreement to fight by proxy: each side would put up a set of triplets, who would then fight one another to the death. Whoever survived would then secure victory for their side. The Albans fielded their renowned warrior triplets from the Curiatius family, the Curiatii; the Romans their Horatii, ancestors of Horatius Cocles. The two sides then massed on a battlefield about five miles out from Rome on the Appian Way, and the six men fought in front of them. Given the high stakes, their fighting was fierce, and the Curiatii became quite seriously wounded at the cost of the lives of two of the Horatii. The remaining Roman, Publius Horatius, realised that he was badly outnumbered, and sought to separate the three Curiatii to increase his chances: he ran across the battlefield until the Curiatii were well split up. He then turned and tackled the least wounded of the Curiatii, killing him. He was next able to turn to the second, and killed him too. This left only the most badly-wounded of the Curiatii, who was easily killed off. Publius Horatius was the victor, as was Rome, forcing Alba Longa to submit to the rule of Rome. Fulchran-Jean Harriet (1776–1805), Combat of the Horatii and the Curiatii (1798), oil on canvas, 113 × 145 cm, École nationale supérieure des beaux-arts, Paris. Wikimedia Commons. 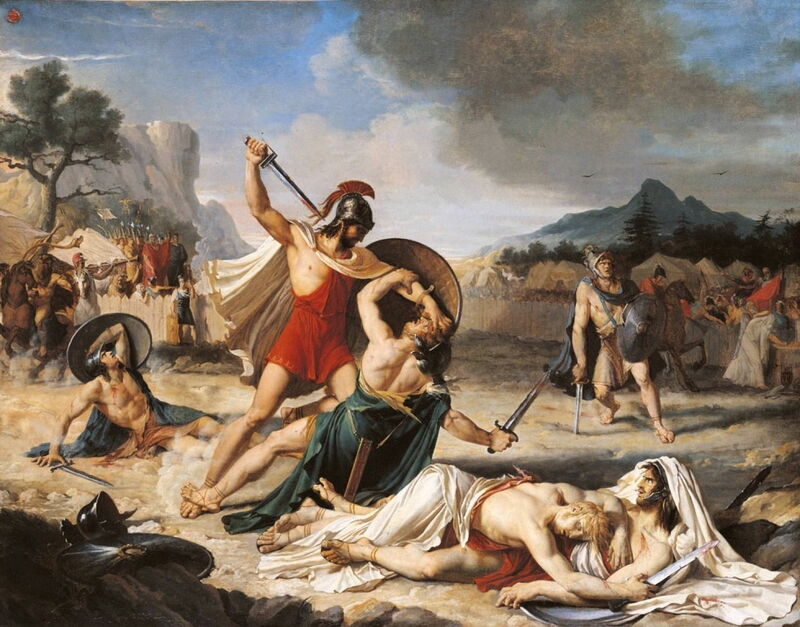 Fulchran-Jean Harriet’s Combat of the Horatii and the Curiatii was the winner of the prestigious Prix de Rome in 1798. It shows a late stage in the battle, as Publius Horatius is killing the Curiatii one by one, starting with the least-wounded of the three. One of his brothers doesn’t appear to be quite dead yet, either. Giuseppe Cesari (1568–1640), Combat of the Horatii and the Curiatii (1612-13), fresco, dimensions not known, Musei Capitolini, Rome. Wikimedia Commons. 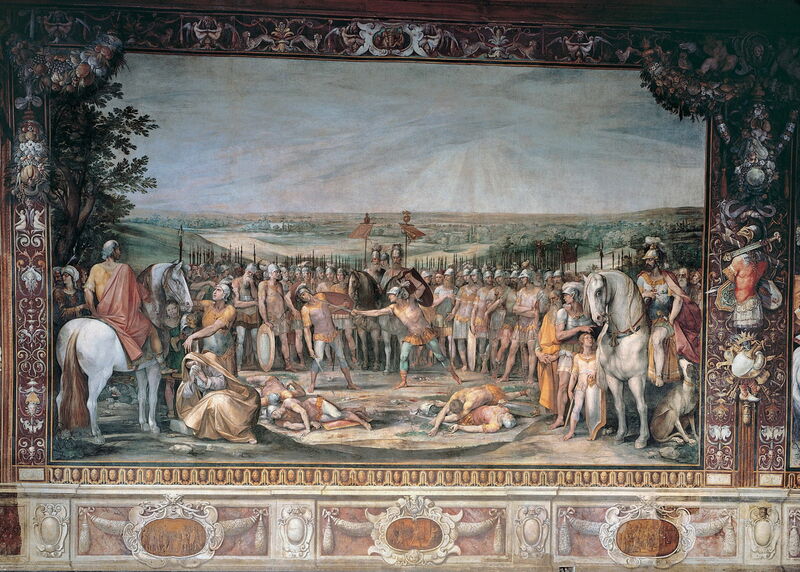 Giuseppe Cesari’s huge fresco Combat of the Horatii and the Curiatii (1612-13) shows the last Curiatius and Horatius (to the right) in the final phases of combat, as the Roman is about to deliver the coup de grace. Publius Horatius’ sister is shown at the left, by the bodies of the two dead Curiatii. As was traditional, Publius Horatius then stripped the three corpses, and returned to Rome. He was greeted there by his sister Camilla, who had been engaged to one of the Curiatii, and immediately broke down and wept for the fate of her fiancé. Her surviving brother, declaring that no one should mourn the fallen enemies of Rome, killed her on the spot. Louis-Jean-François Lagrenée (1725–1805), Horatius Slays his Sister (1750-54), oil on canvas, 134 x 95 cm, Musée des Beaux-Arts de Rouen, Rouen, France. Image by Philippe Alès, via Wikimedia Commons. 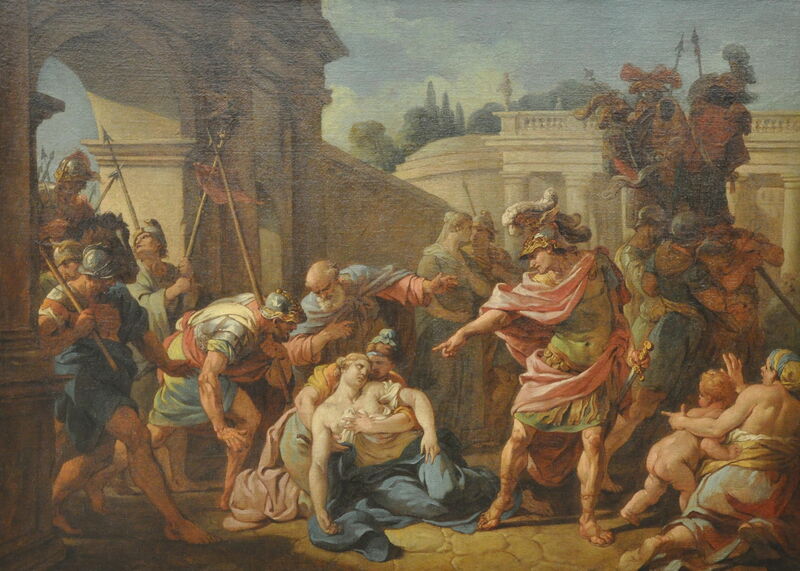 Louis-Jean-François Lagrenée’s Horatius Slays his Sister (1750-54) makes the brother appear thoroughly accusative, even though his sister is already dead. To the right of Horatius, the three bundles of clothes removed from the dead Curiatii are being paraded in public. Francesco de Mura (1696–1784), Horatius Slaying His Sister after the Defeat of the Curiatii (c 1760), oil on canvas, 89 x 143 cm, Private collection. Wikimedia Commons. 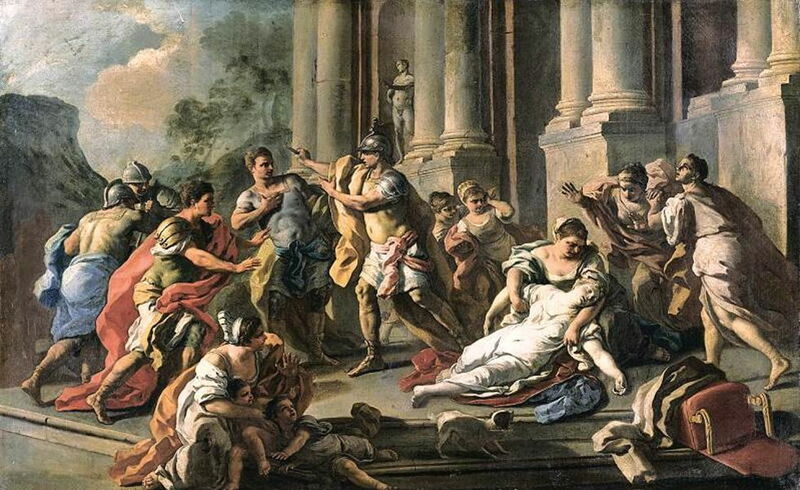 Francesco de Mura’s Horatius Slaying His Sister after the Defeat of the Curiatii (c 1760) shows the shock and fear generated by this murder, but omits the clothing which was said to have been the trigger for Camilla’s grief. 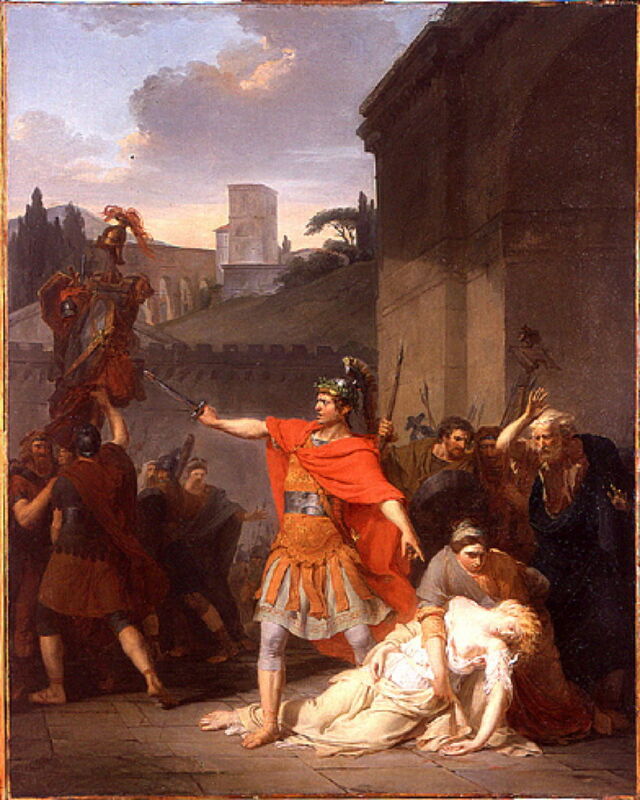 Victor Maximilien Potain (1759–1841), Horatius Killing his Sister (1785), oil on canvas, dimensions not known, École nationale supérieure des beaux-arts, Paris. Wikimedia Commons. Victor Maximilien Potain’s Horatius Killing his Sister was the winner of the Prix de Rome in 1785. Publius Horatius is vociferously condemning his dead sister’s actions, and at the left is a display of the clothes he removed from the Curiatii, as victor. Camilla’s murder was of course a crime, even in times of war, and Publius Horatius was condemned to die as a consequence. However, he appealed to an assembly of the people, which commuted his sentence. The family was required to atone for the crime by making sacrifice to the gods, which became a tradition. 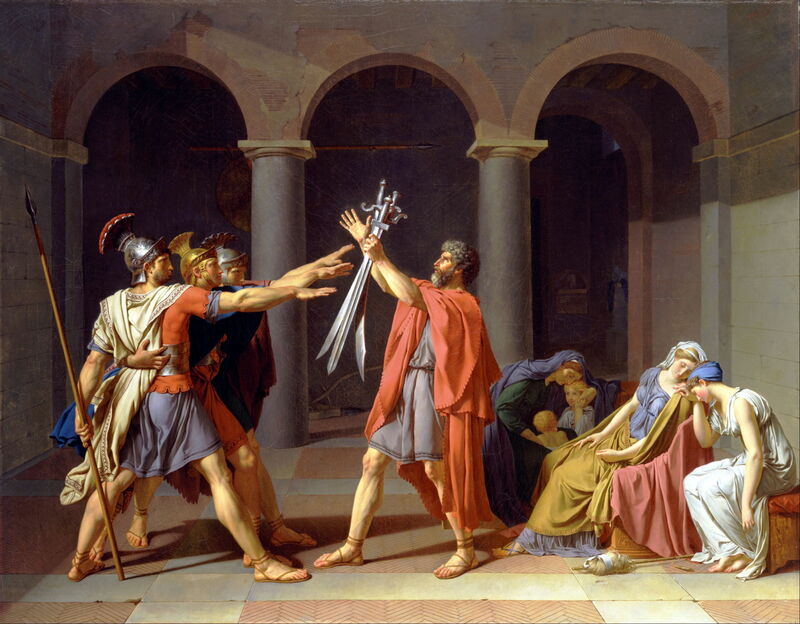 By far the most famous, and most important, painting of the Horatii is bloodless, and shows a scene which does not appear in verbal accounts: it is, of course, Jacques-Louis David’s The Oath of the Horatii (1784-85). Jacques-Louis David (1748–1825), The Oath of the Horatii (copy) (1786, original 1784-5), oil on canvas, 130.2 x 166.7 cm (original 329.8 x 424.8 cm), Toledo Museum of Art, Toledo, OH (original Musée du Louvre). Wikimedia Commons. An image of the original, much larger painting which David made in 1784-85, now in the Louvre, is at the top of this article. Here I show a superior image of the smaller copy made by the artist in 1786, now in Toledo, OH. David had won the Prix de Rome on his fourth attempt, in 1774, for a very different work. David chooses to show the three Horatii saluting their father, and taking their swords immediately before combat. Behind the father are three women, of whom the young woman at the far right is Camilla, sister to the Horatii and betrothed to one of the Curiatii, who thus knows that she will lose someone dear to her no matter what the outcome. David chose a decisive and dramatic instant, which was enhanced and empowered by his brilliant composition and use of body language. This was commissioned for King Louis XVI, as an allegory about loyalty to the state and the monarch, which David interpreted as a message about the nobility of patriotic sacrifice. He cunningly left the viewer to decide where that loyal patriotism should be directed. Within five years, the French Revolution was at its height. But did any of this actually happen? Did two kings really make such a gentlemanly agreement? Once again, even the Roman accounts present them as little more than legends, and some scholars doubt whether king Tullus Hostilius even existed. The whole story may have been invented to account for the destruction of Alba Longa and the absorption of its population into that of the growing city of Rome. Wiseman, TP (2004) The Myths of Rome, University of Exeter Press. ISBN 978 0 85989 704 4. Posted in General, Life, Painting and tagged Cesari, David, de Mura, Harriet, Lagrenée, myth, narrative, painting, Potain. Bookmark the permalink.